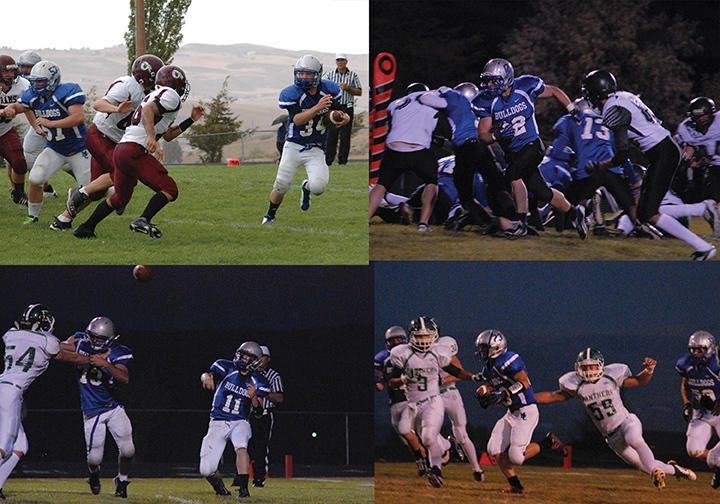 Clockwise from top left: Moffat County High School football players Josh Pritchard, Michael Samuelson, Garrett Stewart and Bubba Ivers were given Western Slope League honors for their play this football season. Samuelson, Stewart and Ivers were All-WSL, while Pritchard was honorable mention. All four are seniors. Several members of the Moffat County High School football team on Monday were honored for their achievements during the season. Bubba Ivers, Michael Samuelson and Garrett Stewart were all named to the all-Western Slope League team, while Josh Pritchard earned honorable mention. All seniors, the four players were common names to hear over the loudspeaker when attending Bulldogs games and contributed in significant ways to the team’s successes in 2012. Ivers, the Bulldogs’ quarterback and defensive back, was one of the best dual-threat QB’s in 3A football. He passed for 1,270 yards and 12 touchdowns, while also leading the team in rushing with 1,413 yards while averaging 8.2 yards per carry and scoring eight more TDs. Samuelson was the team’s workhorse carrying the ball, rushing 157 times for 1,097 yards on the year. He led the team in touchdowns with 16. While making the playoffs was the big goal for the Bulldogs, Samuelson was still honored to be recognized. Stewart was the team’s jack-of-all-trades, starting on offense, defense and special teams, while taking on different roles as a receiver or option tailback on offense and a coverage man or blitzing linebacker on defense. He averaged over 15 yards per rush, more than 13 yards per reception and amassed 74 tackles on the season. Pritchard was the Bulldogs’ leading tackler, with 135 on the year to go with 12 sacks. He was involved with creating nine Moffat County turnovers, good for almost one per game from the defensive side of the ball. Each player was a major part of what made the Bulldogs go, head coach Kip Hafey said. The all-league team was selected by the coaches from the WSL, making it an even bigger honor in Hafey’s mind. The WSL was the largest league in 3A football in 2012 and sent the most teams (four) to the postseason. Three of those teams made the final eight in the state, making All-WSL picks among a select group of players. Samuelson felt more of the Bulldogs could have been recognized.